In 1941 all across the Soviet Union Polish citizens were struggling to survive. They had been deported from Poland to Russia on the orders of the Soviet leader Stalin. Taken from their homes, often in the dead of night, they were crammed onto cattle trucks and after a train journey of many weeks placed in work camps (Gulag) or dumped on the steppe of Kazakhstan. The deportations had begun after the Soviet Union attacked and occupied the eastern part of Poland in 1939. Conditions for the Poles in the Soviet Union were appalling and many had already died. On 22 June 1941 Nazi Germany attacked the Soviet Union. Suddenly the Soviet Union needed all the help it could get. In July Great Britain and the Soviet Union agreed to cooperate in the fight against Nazi Germany. In London the Polish government-in-exile and the Soviet Union came to an agreement that the Soviets would release their Polish prisoners from the camps so that a Polish Army could be formed in Russia to fight the Nazis. This Polish Army was to be commanded by General Wladyslaw Anders who was set free by the Soviet Secret Police (KGB) from the Lubyanka prison in Moscow. The starved, disease-ridden Poles now had a glimmer of hope that they could survive their terrible ordeal in the Soviet Union. A Polish Embassy was opened in Kuibyshev (now called Samara) in Russia. Professor Stanislaw Kot was appointed as Ambassador. The Polish Army HQ was initially set up at Totskoye. The Red Army also offered them bases at Buzuluk, Tatishchevo and Chkalov. The Poles began to be released from their imprisonment but faced the daunting task of finding the Polish Army across the vast distances of the Soviet Union. Polish consular officials and Persons of Trust went to the main railway junctions and cities of northern Russia and Siberia. There they helped released Poles with food, tickets and money and told them where the Polish Army could be found. The late Ryszard Kaczorowski (1919-2010) who became the last President (1989-90) of the Polish government-in-exile in London explained to the author Norman Davies how he was deported from Bialystok at the age of 21. General Anders was concerned at the lack of Polish Officers arriving at Polish Army HQ. Where were they? They didn't know that in the spring of 1940 around 25,000 imprisoned Polish Officers, members of the Police, judiciary and clergy were executed on the orders of the Soviet leader Stalin. This event became known as the Katyn Massacre. In December 1941, with the German Army at the gates of Moscow, Stalin met with General Sikorski (Polish Prime Minister and Commander in Chief) and General Anders in Moscow. Agreement was reached that the Anders army should be moved to the south and that it would be increased to six divisions. General Anders left Totskoye on 15 January 1942, travelling by train on a 5-6 days journey, for Yangi-Yul, 12.5 miles from Tashkent in Uzbekistan. The distances between the bases was huge. The nearest base to Yangi-Yul was 400 miles. The move to the warmer south brought epidemics of typhus and typhoid fever, as well as other diseases such as malaria, and the Polish men and women under Anders' command died at the rate of 300 to 400 a month. General Anders had a further meeting with Stalin in March 1942. They agreed that half the Polish Army and their dependants could be evacuated to the British zone in Persia (Iran). Between 24 March and 5 April 1942, 44,000 Polish soldiers and dependants left the Soviet union by train and ship for Iran. The trains took 3 or 4 days to reach the port of Krasnovodsk on the Caspian Sea. From there, on over crowded ships, the Poles went to the Iranian port of Pahlevi. British Prime Minister Winston Churchill wrote to Stalin suggesting that the bulk of Anders army should be moved to the Middle East. In July 1942 General Anders was advised that he could now move the remaining Polish soldiers and their dependants to Iran. The "2nd Evacuation" began in July 1942 and went on for a couple of months. The last man to leave, on the last organised group of evacuees, was Colonel Klemens Rudnicki, Commander of the 6th Division. He was fortunate to be declared fit to travel as he was suffering from malaria and dysentery. For many of the Poles arriving in Iran their journey would end at Pahlevi. A military nurse, Helena Czupryn, working in the hospital in Pahlevi, recorded that many were too ill to survive. In April 1943 the Germans announced that they had found the bodies of thousands of Polish Officers in a mass grave in the Katyn forest, near Smolensk in Russia. The Polish government-in-exile asked the Red Cross to investigate. In response Stalin broke off diplomatic relations with the Polish government-in-exile, ended the so-called amnesty for Polish citizens and slammed the frontier posts shut. Those Poles who remained in the Soviet Union were now trapped. Polish refugees who went to East Africa usually went by sea from Karachi to Mombassa. The journey took 5 or 6 days. There were eight camps in East Africa set up in the years 1942-43. Other camps were established in Northern and Southern Rhodesia and the Dominion of South Africa. More than half of the Polish civilians who left the Soviet union found refuge in Africa. Most of the Poles who went to India travelled by sea, first to Karachi and then to Bombay. In 1942 they set up home at a camp in Balachadi in Gujarat. In 1943 a second camp was opened at Valivade, 480 miles south of the first camp. Nearly 1,000 Jewish children in Iran were handed over by the Polish Army to the "Jewish Agency" and they were resettled in Palestine. The government of Mexico accepted two groups of Polish refugees. One group left Iran in July 1943 and the other in August 1943. Iran was 8,000 miles away from Mexico by sea. The Mexican government gave the Poles a vast ranch at Santa Rosa in the south-west highlands of Mexico. The New Zealand government accepted 753 orphans and 105 carers who arrived there on 1 November 1944. In 1943 the soldiers of Anders Army were moved from Iran to Iraq. They were tasked with defending the oilfields in northern Iraq from possible German attack. By the summer of 1943 the threat of a German advance into the Middle East had evaporated. In July the British and American armies had landed in Sicily, Italy. In August 1943 convoys of British military trucks began to move the Polish Army from Iraq to Palestine. The Polish soldiers lived in tented encampments and trained rigorously to prepare themselves for battle against the Germans. In November 1943 thousands of Polish troops arrived in Egypt in order to make the sea crossing to Italy. The main elements of the Polish 3rd Carpathian Division set sail from the Egyptian port of Alexandria on 16 December. They arrived at Taranto in Italy on the 21 December. In the following three months 55,000 men and women of Polish II Corps left Egpyt for Southern Italy. 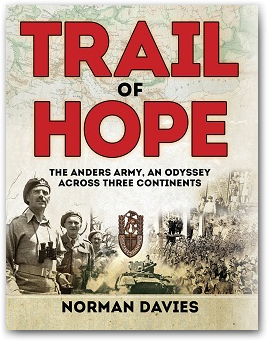 General Anders arrived in Naples on 6 February 1944. Allied forces were in control of Southern Italy but were facing stiff resistance from the Germans as they attempted to move north towards Rome. The Germans held the strategically important Abbey of Monte Cassino. Founded in AD 537 it was the oldest Roman Catholic monastery in the world. The abbey was located at the top of a huge promontory which dominated all the surrounding peaks and valleys. The capture of Monte Cassino was a key allied objective in order to open the road to Rome. Three attempts to capture Monte Cassino had failed. 1st attempt (17 January - 11 Febuary) Lead roles British X Corps and US II Corps - 11,000 allied casualties. 2nd attempt (15 - 18 February 1944) Lead V Corps of British VIII Army. 3rd attempt (15 - 22 March 1944) Lead 2nd New Zealand Divison. In May 1944 the fourth attempt was to be made. General Anders Polish II Corp was given the task of capturing Monte Cassino. The Polish II Corps had been given a very tough task. The first Polish assault on 12 May did not succeed - 281 men and 3,503 men were lost in the attempt. However on 18 May the Poles raised their red and white flag above the monastery ruins and a bugler sounded St Mary's Trumpet Call to signal victory! The next task given to Polish II Corps was the capture of the Italian Adriatic port of Ancona. General Anders brought three main formations to the battle: the 3rd Carpathian Rifle Division, the 5th Kresowa Infantry Division and the 2nd Warsaw Armoured Brigade. The Poles emerged victorious with the battle for Ancona lasting 34 days (16 June - 18 July). In October 1944 the news from Warsaw was bleak. The Polish Home Army, after rising up against the Germans in Warsaw, had been forced to surrender after 63 days. In January 1945 the Soviet Army had overrun the whole of Poland. At the Big Three Conference (USA, USSR & UK) at Yalta (February 1945) it was decided that Poland would belong to the Soviet sphere of influence and that eastern Poland would be incorporated into the Soviet Union. The reaction from the soldiers of Polish II Corp, in the words of Germand Anders, was one of bewilderment and numbness that the Russians had been given control of their homeland. Germany surrendered in May 1945 and the war in Europe came to an end. In June the UK and USA withdrew their recognition of the Polish government-in-exile in London and instead recognised the Soviet imposed government in Poland. General Ander's Polish Army in Italy, still serving under British command, now numbered over 100,000. The Polish soldiers faced the awful recognition that there was no independent Poland to return home to and that a life in exile beckoned. The Polish government in Warsaw and the British government both wanted the Polish soldiers to return to Poland. However British Foreign Secretary Ernest Bevin told the Poles that if they did not want to go to Poland then they could stay in Great Britain. The British created two organisations the Polish Resettlement Corps for army and navy personnel and the Polish Air Force resettlement Corps for airmen. Service in these organisations would last two years and would prepare Poles for a return to civilian life. During the years 1946-1948 the British arranged for ships to bring the Polish forces and civilians to Britain from Italy, the Middle East, Africa, India and the Levant. The Poles on their arrival were sent to camps scattered throughout Britain. About half of those in the Polish Resettlement Corp chose to remain in Britain and half decided to emigrate. A popular destination was Australia: 60,000 Poles emigrated there. Others went to Canada, Argentina or Brazil. Of those that remained in Britain Polish communities began to form in Glasgow, Manchester, Bradford, Birmingham, Coventry and parts of London. Every year on the 11th November Polish veterans join their British counterparts at war memorials throughout Britain to remember those who made the ultimate sacrifice in war and to commemorate the Polish Independence that they fought so long and so hard for. General Anders lived in England until his death aged 77 in 1970. He is buried with his fallen comrades at Monte Cassino. He never returned to Poland. This page was added on 15 October 2016.